In June, we have a reason to celebrate someone. Someone with years of really great service. Someone who has been with us since the very beginning. Some who is pretty much family in all but name. Someone who inspires us. Someone who makes us better! Please, help us raise a glass to Mary. “I remember she had just retired from teaching and we snatched her up.” says Anne. “And John [Mary’s husband] wasn’t very happy!” adds Amanda. 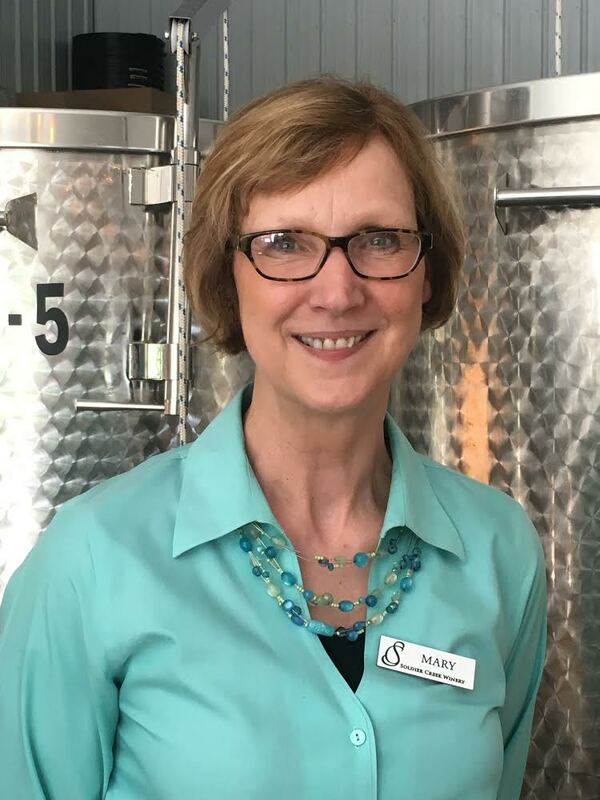 We have had the distinct pleasure of having Mary with us every step of the way, from our first attempts at crawling as a small business to our *current attempt* to run with the other big Iowa wineries. “I love Mary so much, and I’ll miss her! She’s been like family since the very beginning of the winery. I’m sad to see her go, but I’m happy Griffin [Mary’s grandson] gets her!” said Tammi when I asked her how she felt. I can personally say, it’s hard to find someone you want to simultaneously work with and share a glass of wine with. Mary is that lady– it’s easy to share a laugh, a smile, or a fond memory with her. And, she keeps it real. Working in customer service can be a challenging task, but Mary was always up for it and handled everything with a smile. We’ve definitely changed as a business and “location” over the years (4 in July, guys!!) and Mary has been there through it all. But, she isn’t just a sentient being keeping the winery running– she’s an idea woman, she’s an inspiration, she’s helping the winery run more efficiently, she’s just so much. “She’s always been full of ideas for us to do business better, sell wine better, and keep customers happier. And, no matter what, she was always very positive.” says Anne, the winemaker. Mary always makes you feel welcome. She had a real knack for helping you through the wine list, too! “I’m sad that Mary is leaving, but I’m happy she’ll be able to retire closer to her grandson. They’ll have fun in the next phase of their life. Mary was so able in the winery, I’ll miss her ability to smile and greet every person entering the winery with fairness. Mary seemed very happy to see us succeed and was willing to do whatever was necessary to make it happen. That was very comforting for me.” said Bill. If you’ve ever been on the receiving end of Mary’s helpfulness, you know what we mean. She doesn’t just help you– she teaches you, she shows you how. “I really appreciate everything Mary has done for us. She helped us get things off the ground. She has put regimens in place that we still use! Also, she genuinely cares about Soldier Creek like we do. I will miss her so much!” says Amanda, the tasting bar manager and event coordinator. 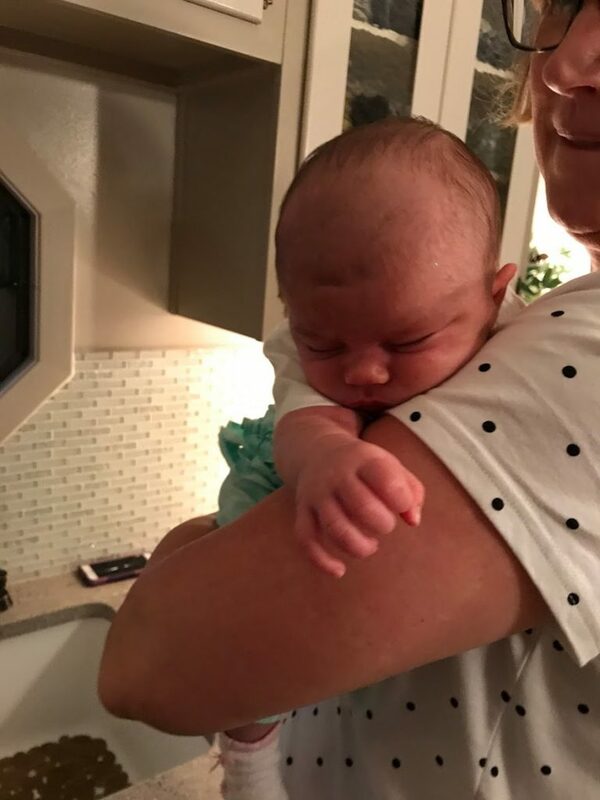 In the last year, we welcomed a new member to our winery family– Cora. When we first brought her to the winery after she was born to introduce her to Mary, it was like introducing her to family. “It’s always so nice to see her smile the moment you walk in the door. Her attitude was always so nice and welcoming for us to bring in Cora. ” says Rob, the vineyard manager. We will miss mary dearly, but we are happy to see her move closer to her family. But, if we can go back to the metaphor of Soldier Creek being a child for one minute, perhaps this is like a Mama letting her baby go out into the world once they’ve grown up a bit? We still have a lot of growing to do, but Mary has helped us learn and has given us the tools we need to succeed. And, for that, we are forever grateful.